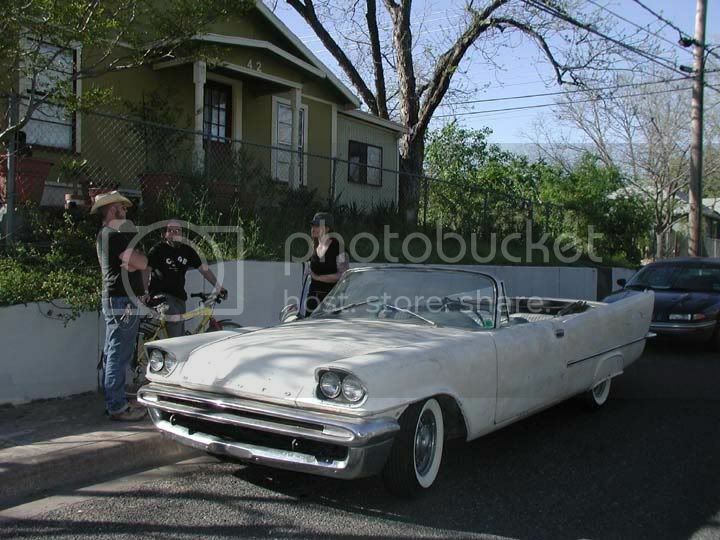 Viewing a thread - 1957 DeSoto Firedome Convertible - The "Glide"
1957 DeSoto Firedome Convertible - The "Glide"
Subject: 1957 DeSoto Firedome Convertible - The "Glide"
I bought my 1957 Desoto Firedome Convertible in 1994 after seeing it sitting in a parking lot with the roof collapsed and water standing in the floorboards. She obviously had not seen any care in some time and my first thought was...hey, she holds water...cant be that bad! After tracking down the owner and coming to an agreement I took her home and back under a shed. Did a quick budget fix on a large number of items and then just drove her happily for many years (without a roof). It was parked near the university somewhere for a while. A friend of mine gave me a photo from 1990 that he took of it prior to my ownership...it was white with a blue top on it. Blue and white tuck and roll interior. From what I can tell this car was modified into a mild custom in the early 60's. When I first found her, I chased down the two prior owners, before the guy I bought it from, and they all said it was already modified when they owned it. In 2004, I moved and built a new garage with a space inside just for her. 2006 - started to fix some of the wrongs done to her by and others. Had her media blasted, started to repair the quarters and rust spots....then had some kids. Work stopped again for a bit. ---I have spoken with John (Big M) and Gary (netparts) and they are on the job and checking for me. recommendations for convertible pump and cylinders supplier? Who makes a good top upholstery kit? 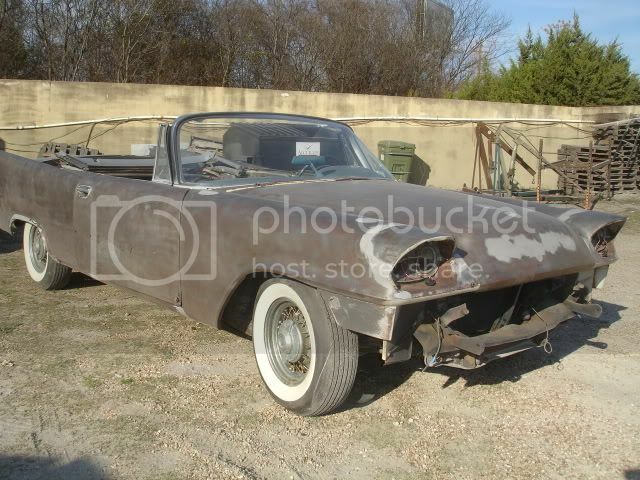 Does anyone make a decent replacement wiring harness for a `57 Desoto Firedome Convertible? or do I need to use a "Painless" or equivalent aftermarket kit? Reputable supplier for replacement gas tank? Anyhow...that's the story. Thanks for all your input so far & Looking forward to getting to know y'all better! Subject: RE: 1957 DeSoto Firedome Convertible - The "Glide"
Location: bishop, ca First poster: WELCOME aboard, to the thread where your ride deserves to be honored! Location: The Mile High City That is wonderful! Great old pictures and a neat story. 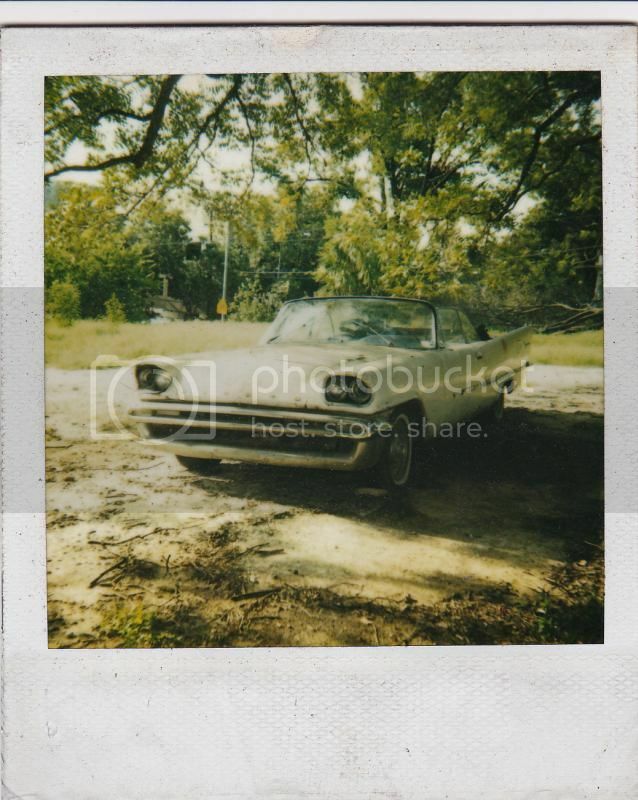 Location: Ocala, Florida Weren't motor wheel wires not available after 56? I guess maybe they could have some left over. OEM possibility to be so equipped. blackwalls on a big body car. Location: Upper East Tennessee Awesome Car! I think I've been in touch with you on the HAMB. You won't go wrong with that Greg Leggatt harness. It fits perfectly! Location: bishop, ca And for a suitable residence-tract for this car, as per the illustration, above, go see the newest addition in the Forwardlook house thread. Location: Ontario, Canada I think he already has the 341. I think the challenge is for me to come up with a harness that fits the " temporary motor" and can later be altered to fit the 341 and do so in an invisible manner!!! Hey, bring it on!! The impossible only takes a bit longer!!! Location: Perth Australia Cant make a plug to go on the inside of the firewall Greg? Location: Under the X in Texas You may recall I saw you drive away from the old original location of the Lone Star Roundup and gave chase until you parked at home where we talked about the car with you making it abundantly clear you would not sell and were about to start some restoration when the garage was complete. So glad to see and hear that was all true and continues progressing. Monotone paint on these '57 Fireflites with the single side trim strip gives a Letter Car flavor to their appearance and looks great. Carry on ! can run the exhaust through the OEM exhaust tips, without having any corrosion occur on the tips or bumper areas. will not present a corrosion issue). The Chrysler performance mufflers, Sono-4Xers, have weep holes on their lower rear panels....probably many other mufflers do, too. Exhaust coming out of those tips is a Kool thing to see! BTW, aluminized pipes look like OEM steel, and are not very expensive. I run 2 1/4" o.d. pipes on my car; 2" i.d. .
to see what would happen...not much did. Location: Austin, TX Wow. Great bunch of info and thanks for everyones well wishes! I am removing the frenched tail light extensions...I do like the original look of the tail lights and at the way they flow into the bumpers. The way these were done just don't work for me. At this time, a fine metallic light sky blue with a pearl clear overall is the plan. It will be a nod to the blue that she has worn before but mild custom and clean. I want to show off her lines. I like the tuck and roll interior so will get similar redone where needed. She has been a mild custom since she was a young car so I'm not going to restore but also try to make her better than she is now and "do no harm" as the saying goes. As for the two tone vs the single spear...I have the trim for both and am on the fence until I get further down the path. I can see the beauty in both so, you never know..
And Wayne, I do remember talking with you. Good to hear from you again! Hi, I have a '57 Adventurer HT which I'm doing a light restoration on later this year. I was thinking of re-routing the exhausts back up through the bumper tips as original. I have good original exhaust tips inside the chrome bumper tips but was considering having some re made in stainless to avoid corrosion. I noticed in your message you mentioned this and wondered if you knew of a source of these before I go and re-invent the wheel and make some from scratch? Also the bits I have missing are the curved bits of pipe from the main exhaust up to the little flared tips inside the bumper - any ideas where I might find some or even photos/dimensions? My other thought was to maybe put some extra "fins" (like on air cooled cylinders) on the exhaust just before it enters the tips to try to dissipate some heat - I heard that as well as corroding the tips, the heat often melted the plastic tail lights! This is my first American car and I am in the UK so this forum is brilliant. So great to be able to chat to fellow Forward Look nuts! Location: New Castle PA Mark, I don't mean to jump in here when you weren't speaking to me, BUT the venturi are tough to make. I had these made (see picture) in stainless a few years ago, but ended up pounding them, cutting them, and mashing them (not very technical terms, but you know what I mean) in order to make them fit in the bumper ends. There's not much room in there for error, and the radius of turn is very sharp. I'm sure a very good metal man CAN reproduce them accurately, but all I'm saying is that there isn't much tolerance for error in the fitment. Location: Jamaica Plain, MA What a great car. Seems like you are in relatively good shape for parts. I imagine you will need to have the interior made up. I think most convertibles had vinyl seat inserts, etc. Kind of a basket weave type stuff similar to what VW and Porsche used, but distinctive. Maybe a local shop can make some. Door cards aren't too tough if you get the material you like and you have the right stainless. Firedomes had door cards that were much simpler than Fireflites and Adventurers. Just cardboard of a special but easy to obtain type, a plastic water curtain, a layer of felt, and the vinyl of your choice. Most repro interiors are a little different from the original heat-embossed ones. And Ed, I still think the Firesweeps might've had different front bumpers than the senior models. Although, that doesn't make sense. The jet-intake maw is more gaping on the Sweep, at least mine. I'll post a pic somewhere else. Maybe the folks who redid my bumper un-smushed it so it looks like the opening is wider top-to-bottom. PS, I like the frenched tail lights, but I'm not a big purest. 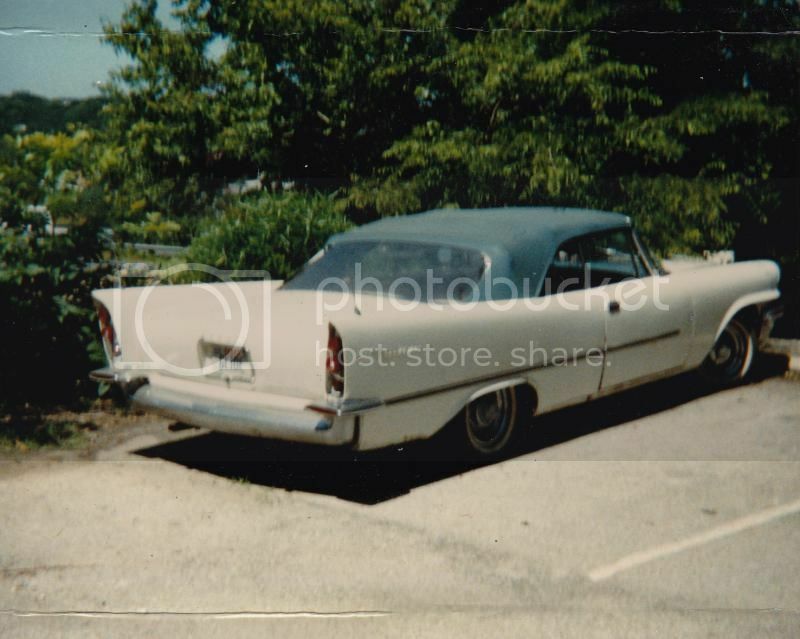 Location: Hickory, NC The DeSotos with the exhaust exiting the bumper was always cool to me! I was always curious as to how it was routed. The pictures were helpful! Hi Ed, no problem at all butting in, I just saw the thread and thought I'd see what I could find out without troubling you again - but it seems all roads eventually lead back to you as the technical guru!! Wonderful pictures and I can immediately see how difficult these would be to make but I think I will have a go if/when I get around to my "light and sympathetic" restoration of the paintwork and trim - I'm just doing my homework in advance! I'm wondering how on earth to measure and draw out those connecting pieces - they look more complicated than the venturis although maybe a little bit more room for error? I would not want you to go to any major trouble but if you do have some measurements I can use as a base for the connecting pieces that would be great - no hurry though!! The only section I can't figure out at all is how the venturis connect with the connecting pieces - once inside the bumper you can't see. Also, with the shape of that "funnel" like ending which mates with the exhaust tube, I'm guessing that the exhaust tube just sort of "floats" inside that funnel shape to allow for movement? Thanks as always - you are an absolute mine of information!! Location: New Castle PA Mark, I've never seen a completely original connection between the main exhaust pipe and the bell-shaped extensions. By the time I became involved with these cars, the original set-ups were long gone. Maybe someone on here knows better than me, but from what I've seen, like in this picture from my own Adventurer before I touched anything, you're right about it "floating" in the funnel. intensive and a PITA !!! Location: Austin, TX Thanks all. Sorry I dropped off...work and kids, I'm sure a bunch of yall are familiar with that. I have found a decent set of floorboards (thanks John!) and now am waiting to get time (and cooler weather) to deal with that issue. I can say that (at this time) I am leaning more towards the single body color with the simple trim. I am also still planning on the Greg Leggatt harness. but before I can do any of this fun, I have to get the floors in place. Location: Upper East Tennessee Can't wait to see the progress on this one! 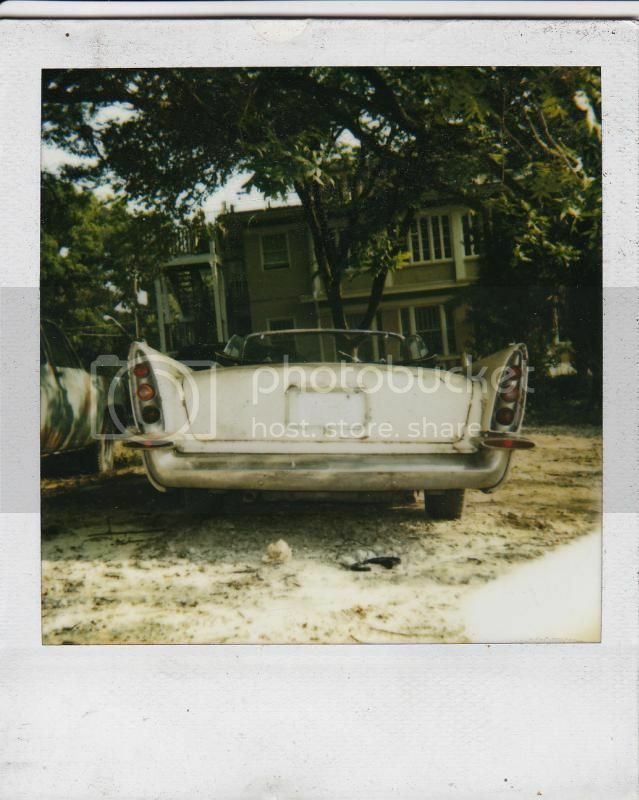 Location: Austin, TX BTW...if anyone runs across any old show photos from the mid 60's with possibly this car in it, or come across anything please let me know. I KNOW, It is a LONGSHOT but the eyes on this board are good at spotting them in a field of Fords and Chevys...thanks! Awesome Car!!! And what a neat story to go with it. Hope she goes together nice and smooooth for you!! She is still sitting inside the garage getting dusty and becoming temporary storage (she takes up a lot of space). I realized the old photos had disappeared so wanted to refresh the links. 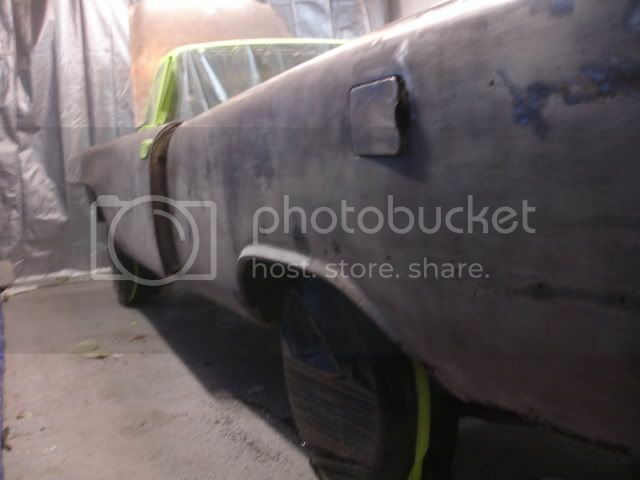 This is from before I pulled her apart for plastic media blasting...now still in etch primer and apart. Location: Hay Lakes, Alberta, Canada Get the kids working on it!!! They need to do their part! I'm just not getting around to working on the Glide, and as such am unfortunately starting to think about selling her so that this rebuild would actually happen and be done properly by someone with the time and $ resources to make it happen... I am just not finding the time for it. I drove her into the garage and to prep for the media blasting, basically removed the seats and door panels, bumpers, side trim, taillights and headlights. I still love this car but just not on my priority list any longer. Kids and family are priority 1. 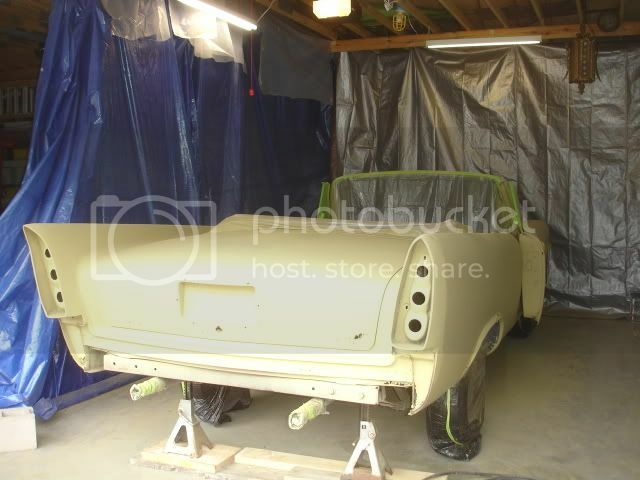 I also have a 2 dr fireflite hardtop parts car with drivetrain (I was entertaining going the restore route) and full floor pan from a high desert car (Big M) to patch the holes under the seats and trunk. Trying to get an idea of what she might be worth. Help is appreciated. Location: DFW, TX Howdy Clif! Long time no see. This is Danny, the guy in Fort Worth that sold you a red Firedome coupe. Or what was left of it! Thanks man. Still deciding on keeping or selling and working through this. I've had her for 20+ years, so kind of a family member in a way. So deciding what is best for all. Yes, we need to get together and catch up. I still have that coupe/parts car...exactly as it was after selling you the hood and bumper for your NYer project. Location: Austin, TX OK, she needs a new home. I've been wrapped up in a home remodel and with the family and such, simply don't see getting back to her. I'm going to ask $40k as there are only a handful of these left in existence and I am in NO rush to sell. I don't need help selling and plan on using hopefully only the Forward Look site to find the next owner. I don't have any new photos and since it has been a very long while there is a layer of dust on everything. Will take some new photos in the spring if she doesn't sell by then. 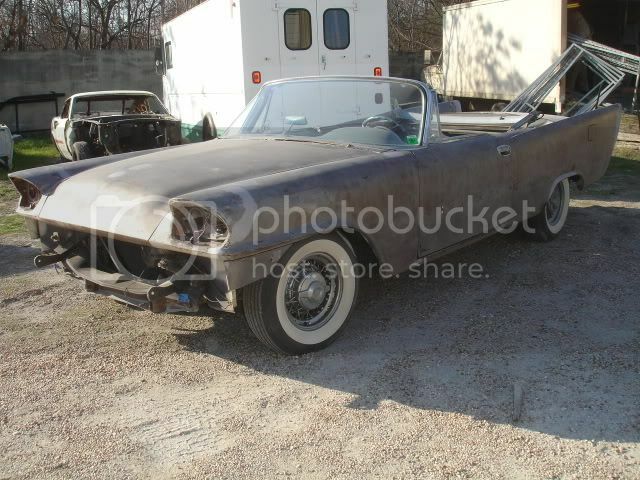 Comes with a very rusty 2Dr hardtop parts car...if you want it. Location: Under the X in Texas April 3, 2005. Remember me following you home from the LSRU? Location: Austin, TX Ha! Yes, and sure doesn’t feel like that was that long ago.